Read the post to get the insight on Important Books for CLAT 2018 preparation. Common Law Admission Test (CLAT) is a popular national level exam conducted by 18 National Law Universities (NLUs) on a rotational basis for Students seeking admission to integrated LLB and LLM programs. Getting an idea of important books. Candidates must read the important books to develop an understanding of the topic which will be helpful to crack CLAT 2018 Exam. 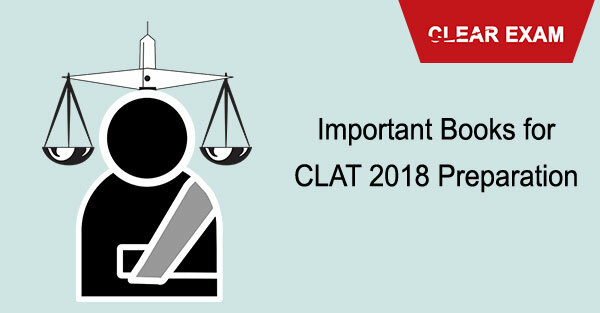 Before proceeding, the candidates should be aware of CLAT 2018 Syllabus & Exam Pattern. This section contains reading comprehension wherein a passage will be given and you will be asked to answer questions based on your understanding of the passage. Moreover, there will be questions on synonyms, antonyms, idioms and phrases, one-word substitution, sentence improvement, fill in the blanks, spelling errors etc. Then there will be questions where you have to correct grammatical errors. There will be questions on statement assumptions, statement conclusions, statement arguments, statement actions. There will also be questions such as completion of series, coding-decoding, blood relationships, analogy. The book I recommend is R.S. Aggarwal book called Verbal and Non-verbal reasoning by RS Aggarwal. This section will have questions from Constitution, Indian penal code, Torts, Contracts, Family law and perhaps a few questions from IPR and labour laws and leftover topics. I recommend a good module from any established coaching centre such as success mantra. This module should be more than enough for you to prepare for the legal reasoning section. This section contains only 20 marks worth of questions but you to have prepared for topics such as the number system, square roots, HCF and LCM, ratio--proportions, average, logarithms, fractions, work-time, interest, percentages, profit-loss, partnership, areas and volume, permutation-combination, probability, clocks and calendars and data interpretation. Going through success mantra's material for Maths should be more than good enough but if you want to refer to a book on occasion then the book I recommend is RS Aggarwal. The GK section comprises of two subsections which are static GK and current affairs. The current affairs include events of both national and international importance, developments in the field of economics, science, sports, important events that happened in different places and persons in news. The book you should refer to is Manorama Year Book and you could also go for Competition Success magazine's yearbook and monthly editions. Do not under prepare but do not over prepare either. Stick to the syllabus. I believe in modules more than books and I suggest you get hold of a good module which covers the entire syllabus such as success mantras module which has a complete material and along with that has free practice tests which you must take to know where you stand vis-a-vis your competition. For quick revision, you should buy Universal Law Guide which will also give you an idea of questions you can expect. Also, you must get hold of past year papers. A book which has a compilation of past year papers is CLAT solved and practice papers by AP Bhardwaj. These books should do you good. All the best. Read the post to follow important books for CLAT 2018 preparation. Here, the important books for CLAT 2018 are mentioned subject wise.